Respiratory viral infections increase inflammatory responses to concurrent or secondary bacterial challenges, thereby worsening disease outcome. This potentiation of inflammation is explained at least in part by IFN-γ promoting increased sensitivity to TNF-α and LPS. We sought to determine whether and, if so, how IFN-γ can modulate proinflammatory responses to TNF-α and LPS by epithelial cells, which are key effector cells in the airways. Preincubation of airway epithelial-like NCI-H292 cells with IFN-γ resulted in a hyperresponsive IL-6 and IL-8 production to TNF-α and LPS. The underlying mechanism involved the induction of indoleamine 2,3-dioxygenase, which catabolized the essential amino acid, tryptophan. Depletion of tryptophan led to stabilization of IL-6 and IL-8 mRNA and increased IL-6 and IL-8 responses, whereas supplementing tryptophan largely restored these changes. This novel mechanism may be implicated in enhanced inflammatory responses to bacterial challenges following viral infection. Viral infections can profoundly potentiate inflammatory responses to a concurrent or secondary bacterial challenge, worsening inflammation and disease symptoms (1, 2). In humans, respiratory influenza infections are known to predispose for severe secondary bacterial infections in the respiratory tract (3, 4), and there are several other examples of viral-induced increased responsiveness to bacteria in humans and animal models (5, 6). How a viral infection increases responsiveness to a bacterial challenge is not well understood. TNF-α, IL-12, and IFN-γ are induced by both bacteria and viruses, and play key roles in the lethal response to a bacterial or LPS challenge preceded by a viral infection (7, 8, 9). In fact, concurrent viral and LPS challenges in mice synergize in TNF-α, IL-12, and IFN-γ responses, resulting in markedly increased local and systemic levels of these mediators (2). Of these mediators, IFN-γ appears to act by promoting increased responsiveness to bacteria and LPS, as is evident from dual challenge studies in which biological activity of IFN-γ was impaired (2, 8, 10). This increased responsiveness is achieved, at least in part, by enhancing TNF-α synthesis and that of its receptor (11, 12). Proximal airway epithelial cells are key effector cells in the airways, producing proinflammatory mediators such as IL-6 and IL-8 in response to viruses, bacteria, and inflammatory stimuli like TNF-α (13, 14). As IFN-γ is considered a major modulator of innate immune responses, the present study was aimed to reveal whether and, if so, by which mechanism IFN-γ can amplify epithelial IL-6 and IL-8 responses to TNF-α and LPS. IL-6 and IL-8 responses by airway epithelial cells are normally tightly regulated resulting in transient and thus limited production of these mediators (15, 16). Previous in vitro studies with airway epithelial-like NCI-H292 and Calu-3 cells and also primary bronchial epithelial cells indicated, however, that partial inhibition of their de novo protein synthesis resulted in exaggerated IL-6 and IL-8 responses, as reflected by steeper dose response curves and a prolonged production (17). In these epithelial cells, IL-6 and IL-8 mRNA steady state levels increased up to 100-fold, which was due predominantly to stabilization of IL-6 and IL-8 mRNA. Because there are no intracellular stores of IL-6 and IL-8 in these cells, IL-6 and IL-8 were synthesized de novo, despite partial inhibition of protein synthesis. It is envisaged that the increased levels of IL-6 and IL-8 mRNAs outcompete other mRNAs for the remaining translational activity. In lungs of mice infected with influenza virus, IFN-γ markedly induced the tryptophan-catabolizing enzyme indoleamine 2,3-dioxygenase (IDO)3 (3) (18, 19). Recently, Munn and colleagues (20, 21) showed that expression of IDO by murine trophoblasts caused local depletion of tryptophan in vivo. Because tryptophan is an essential amino acid, its depletion will impair protein synthesis. Therefore, we were interested to assess whether IFN-γ induced IDO in NCI-H292 cells and, if so, whether this affected IL-6 and IL-8 responsiveness. We found that IFN-γ induced IDO and mediated exaggerated IL-6 and IL-8 responses to TNF-α and LPS. Recombinant human IFN-γ (Roche Molecular Biochemicals), recombinant human TNF-α (R&D Systems, Minneapolis, MN), and LPS (Sigma Aldrich, St. Louis, MO) were used at final concentrations of 100 U/ml, 10 ng/ml, and 10 μg/ml, respectively, unless specified otherwise. Actinomycin D (Roche Molecular Biochemicals) was used at 10 μg/ml. Anti-IFN-γ (MD-1) was provided by Dr. v. d. Meide (22). 1-Methyl-dl-tryptophan (MT; Sigma Aldrich) was solubilized by sonication at 1 mM in PBS. The human lung mucoepidermoid carcinoma derived cell line NCI-H292 (CRL 1848; American Type Culture Collection, Manassas, VA) and the human lung adenocarcinoma derived Calu-3 cells (HTB 55; American Type Culture Collection), were cultured and propagated as described before (16, 23). After overnight incubation, cells were exposed to stimuli in fresh medium and treated as indicated. Culture supernatants were stored at −20°C until IL-6 or IL-8 determination. None of the conditions resulted in shedding of adherent cells or morphological changes as assessed by light microscopy. Each condition was tested in triplicate and experiments were conducted at least three times unless specified otherwise. Tryptophan and 3-OH-kynurenine were measured using a Pharmacia Alpha Plus amino acid analyzer (Pharmacia, Peapack, NJ). The method is based on cation-exchange chromatography with lithium citrate buffers and post column ninhydrin detection according to Moore et al. (24). Before analyses, samples were concentrated by lyophilization and reconstituted in one-tenth of the original volume. IL-6 was determined by ELISA as described (25). IL-8 was determined by ELISA using the catching and detecting anti IL-8 Abs from BioSource International (Camarillo, CA). Total RNA was extracted from NCI-H292 cells using TRIzol (Life Technologies, Rockville, MD) and subjected to northern and dot-blotting and hybridization using standard protocols (16). After washing, blots were quantified with a PhosphoImager using the ImageQuant software (Molecular Dynamics, Sunnyvale, CA). The IDO probe was obtained from Dr. S. L. Gupta (Hipple Cancer Research Center, Dayton, OH; Ref. 26). A GAPDH probe was derived by PCR (encoding region 488–570) using the following primers: 5′-GGTCATCCATGACAACTTTGG-3′ (sense) and 5′-CATCCACAGTCTTCTGGGTGGCA-3′ (antisense). For mRNA t1/2 determination, cells were exposed to IFN-γ for a given period, followed by 1 h of incubation with TNF-α to increase IL-6 and IL-8 mRNA levels (15, 16). Then, actinomycin D was added to block RNA synthesis, and total RNA was collected after 0, 40, 80 and 120 min. Per experiment, each condition was tested in triplicate. IDO activity was determined according to Feng and Taylor (27). In brief, cells were detached with trypsin, lyophilized, resuspended in PBS and cleared from insoluble material by centrifugation. The supernatant was incubated with l-tryptophan in a reaction buffer for 30 min at 37°C, after which the reaction was terminated with TCA. The resulting N-formylkynurenine, was hydrolyzed to kynurenine at 50°C for 30 min, followed by the addition of an equal volume of Ehrlich reagent (Sigma Aldrich). The product was read at 490 nm in a microplate reader (Titertek multiskan MCC/340; Titertek, Huntsville, AL). OD values above background (PBS only) were used to calculate fold-induction. The basal level of expression in untreated cells was set at 1.0. IDO activities were corrected for protein content (Bio-Rad protein assay; Bio-Rad, Hercules, CA). A total of 140 nCi of U-14C-leucine (50 μCi/ml; Amersham Pharmacia Biotech, Piscataway, NJ) were added to NCI-H292 cells in 1 ml of medium in a 24-well plate. After 4 h of incubation, cells were lysed 100 μl of 11% (w/v) Triton X-100 (Merck). After 30 min, the lysate was collected and cleared by centrifugation. Proteins from the supernatant were precipitated with 10% (w/v) TCA and collected by centrifugation. Pellets were washed once with 10% TCA and resolubilized overnight in 1 N NaOH before determining radioactivity. Per experiment, each condition was tested five times. After incubation, cells were detached using trypsin/EDTA at room temperature (28). Cell surface expression of HLA-DR was evaluated using PE-anti-HLA-DR (BD Biosciences, Mountain View, CA) as compared with an isotype control (IgG2a), using a FACScan (BD Biosciences). Data were analyzed for statistical significance using the one sample t test or a nonparametric ANOVA (Kruskal-Wallis test) when appropriate. A value of p < 0.05 was considered significant. Correlation was assessed with the Spearman rank correlation test. NCI-H292 cells (3 × 105/500 μl) exposed to IFN-γ for 24 h produced IL-6 in a dose-dependent manner (Fig. 1⇓A). Additional experiments were conducted using 100 U/ml IFN-γ, because this level is considered pathophysiologically relevant (11, 12). Exposure to 100 U/ml IFN-γ for 24 h stimulated IL-6 production 32.4 ± 23.8-fold (mean ± S.D. ; n = 9; p = 0.004). When 10 and 50 μg/ml anti-IFN-γ were added to IFN-γ, the production of IL-6 by IFN-γ was inhibited for 54 ± 21% (mean ± SD; n = 3; p = 0.047) and for 83 and 70% (n = 2) respectively, confirming induction by IFN-γ. 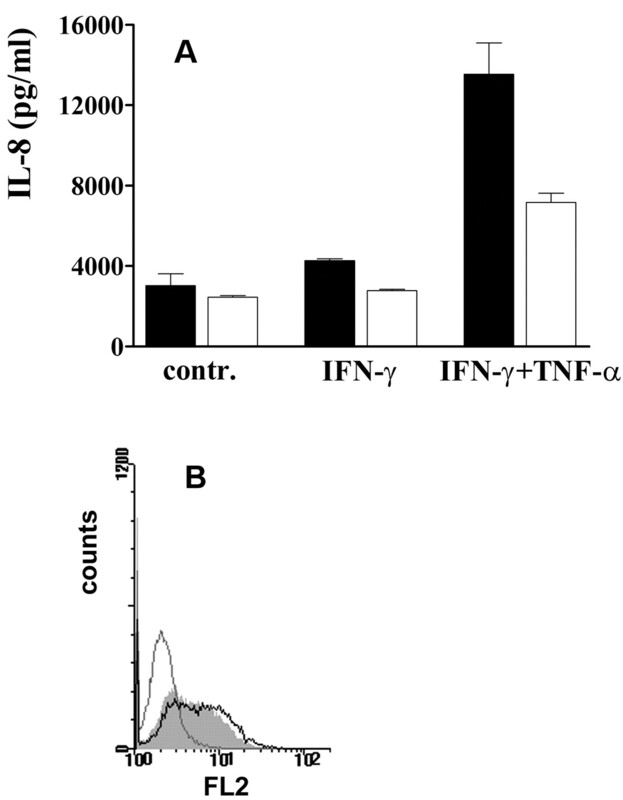 IFN-γ-induced IL-6 production and the effect of exogenous tryptophan. A, NCI-H292 cells were exposed to various IFN-γ concentrations for 24 h, and IL-6 was determined in culture supernatants by ELISA. B, Cells were exposed for 24 h to IFN-γ (100 U/ml), LPS (10 μg/ml), or TNF-α (5 ng/ml) in the absence (filled bars) or presence (open bars) of additional tryptophan (10 μg/ml). Further conditions as described in A. C, Like described in B, but now cells were exposed also to IFN-γ plus LPS and IFN-γ plus TNF-α. Typical experiments are shown (triplicate samples; mean ± SD). Next, we determined the amino acid composition of 24-h-culture medium from resting and IFN-γ-stimulated cells as compared with that of unconditioned medium. Tryptophan levels were reduced by ∼60% (from 23 to 8 μmol/L) in medium from resting cells and by ∼94% (from 23 to ∼1.25 μmol/L; i.e., lower detection limit) in medium from IFN-γ-stimulated cells. Tryptophan is oxidized by IDO to kynurenine. Kynurenine was found only in medium from cells exposed to IFN-γ (∼5 μmol/L). These findings are in accord with the hypothesis that IFN-γ induced IDO in NCI-H292 cells, depleting tryptophan and giving rise to kynurenine. We reasoned that if depletion of tryptophan enhances the production of IL-6 by IFN-γ, the addition of tryptophan would inhibit IL-6 production by IFN-γ. Addition of tryptophan (10 μg/ml; i.e., 48 μmol/L) indeed reduced IFN-γ-induced IL-6 production by 58.8 ± 24.7% (mean ± SD; n = 8; p = 0.0003; see also Fig. 1⇑B). There was a positive correlation between the induction of IL-6 by IFN-γ and the inhibition of IL-6 production by tryptophan (r = 0.95; p = 0.001). In other words, the more IFN-γ stimulated the production of IL-6, the more tryptophan inhibited IL-6 production. This indicates that IL-6 production by IFN-γ depends largely on tryptophan depletion. Addition of 50 μg/ml tryptophan did not further reduce IL-6 production (n = 2; data not shown). At 1 μg/ml tryptophan, IL-6 production was inhibited only 5% (n = 2). In subsequent experiments, 10 μg/ml tryptophan was added. The addition of tryptophan to cells exposed for 24 h to TNF-α (5 ng/ml) or LPS (10 μg/ml) did not inhibit IL-6 production (Fig. 1⇑B). IFN-γ, however, synergized with TNF-α and LPS in IL-6 production, which was inhibited substantially by the addition of tryptophan (Fig. 1⇑C). To exclude that kynurenine affected IL-6 production, unstimulated and TNF-α- and LPS-stimulated cells were exposed concomitantly to 10 μg/ml kynurenine during 24 h. Kynurenine did not affect basal nor stimulated IL-6 production (n = 2; data not shown). Thus IFN-γ alone, and in synergy with other stimuli, induces the production of IL-6 which is dependent to a large extent on the depletion of extracellular tryptophan. The depletion of tryptophan by IFN-γ is likely to be mediated by IDO. MT is a competitive inhibitor of IDO (29). The simultaneous addition of MT (10 μM) and IFN-γ reduced IL-6 production 29.6 ± 17.8% (mean ± SD; n = 5; p = 0.02) as compared with parallel cultures exposed to IFN-γ only (Fig. 2⇓A). At 50 μM, MT inhibited the IFN-γ-induced IL-6 production for 54 and 45% in two independent experiments. 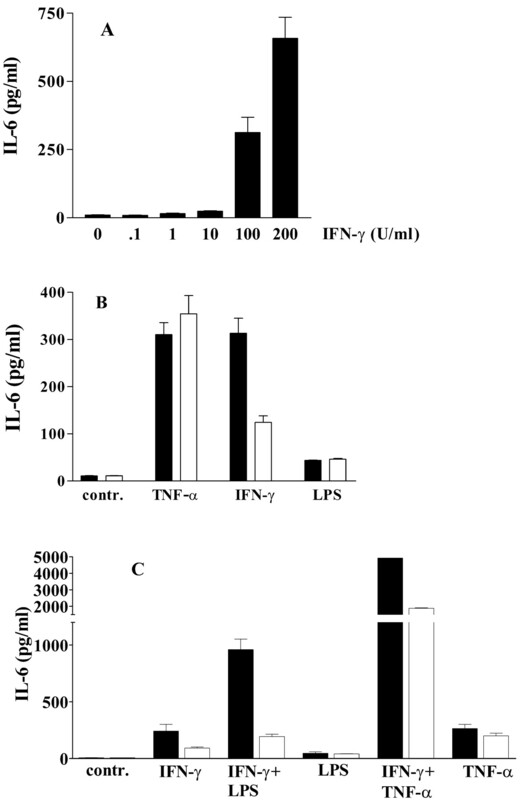 MT inhibited IL-6 production induced by IFN-γ and LPS to a similar extent as for IFN-γ alone (two separate experiments; Fig. 2⇓A, inset). MT did not affect the basal (Fig. 2⇓A) nor the TNF-α- and LPS-induced IL-6 production (data not shown). Induction of IDO and its role in IL-6 production. A, NCI-H292 cells were exposed to 100 U/ml of IFN-γ for 24 h in the absence or presence of MT (10 and 50 μg/ml, MT10 and MT50 respectively), an inhibitor of IDO. IL-6 was determined in culture supernatants by ELISA. A typical experiment is shown (triplicate samples; mean ± SD). The inset shows effect of MT on IFN-γ plus LPS-induced IL-6 production (two experiments; triplicate samples; mean ± SD) B, Northern blot analysis for IDO mRNA in NCI-H292 cells exposed to 0 or 100 U/ml IFN-γ for 24 h (4 μg RNA/lane; n = 3). Equal loading was confirmed with ribosomal RNA. Size of RNA was estimated using a RNA marker (0.28–6.58 kb; Promega). C, Induction of IDO enzyme activity after 24 h-exposure to indicated stimuli (concentrations as in Fig. 1⇑). A typical experiment is shown (duplicate samples; mean values). Readings for unstimulated cells were only slightly higher than controls (PBS without cells), in accord with the low steady state level of IDO mRNA in unstimulated cells. Next we determined whether exposure to IFN-γ induced IDO mRNA and IDO activity. Northern blot analysis revealed a strong hybridizing band of ∼1400 bases and a weak band of ∼1800 bases in RNA from cells exposed to IFN-γ for 24 h, but not in that from unstimulated cells (Fig. 2⇑B). The 1400 band corresponds to the expected 1475 bases for IDO mRNA (NCBI; NM 002164). The nature of the weak band is unknown, but an identical pattern was observed earlier for RNA derived from murine cells (30). After 24 h of exposure to IFN-γ, IDO activity was increased 14.4 ± 5.3-fold (mean ± SD; n = 3; p = 0.048; Fig. 2⇑C). Neither TNF-α nor LPS induced IDO activity. Neither LPS or TNF-α synergized with IFN-γ in inducing IDO activity (n = 4 and n = 3, respectively). This indicates that IDO mRNA and protein expression are induced by IFN-γ, and that IDO-mediated tryptophan depletion is implicated in IL-6 production. IL-8 gene transcription in primary bronchial epithelial cells is not or is poorly induced by IFN-γ (31). Exposure of NCI-H292 cells to IFN-γ yielded, at best, marginally increased levels of IL-8, which were not inhibited or were slightly inhibited by the addition of tryptophan. However, when a known stimulus of IL-8 production by NCI-H292 cells like TNF-α or LPS (data not shown) was added in combination with IFN-γ, IL-8 production increased markedly and became inhibitable by tryptophan (Fig. 3⇓A; cf Fig. 1⇑C). IL-8 production induced by TNF-α or LPS alone was not inhibited by exogenous tryptophan (data not shown). 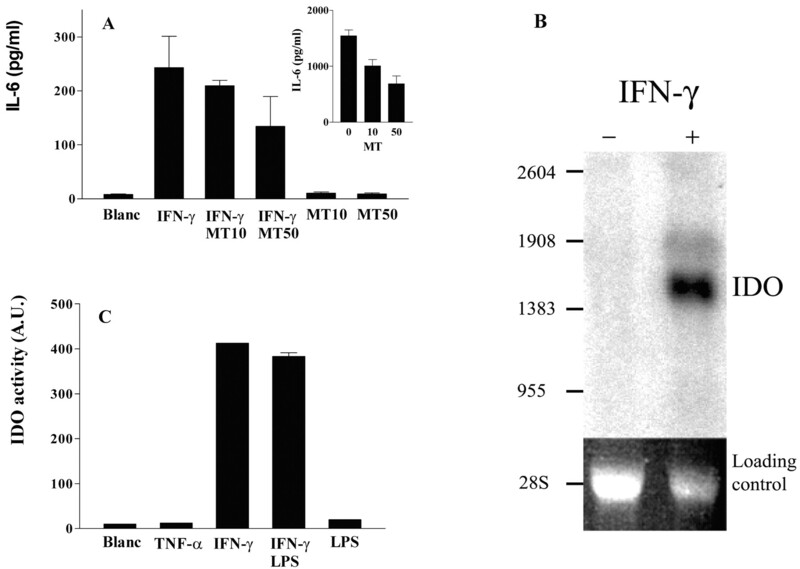 MT inhibited the IFN-γ-induced IL-8 production to a similar extent as assessed for IL-6 (cf Fig. 2⇑). Induction of IL-8 and HLA-DR in NCI-H292 cells by IFN-γ, and the effect of tryptophan. NCI-H292 cells were exposed for 24 h to IFN-γ and IFN-γ and TNF-α, in the absence (filled bars) or presence (open bars) of additional tryptophan. A, IL-8 was determined in culture supernatants by ELISA. Typical experiment is shown (triplicate samples; mean ± SD). B, After 24 h, cells were detached by mild proteolysis (28 ) and HLA-DR expression was measured by FACS. Analyses of cells not exposed to IFN-γ (thin line), exposed to IFN-γ (shaded area) and to IFN-γ with tryptophan (thick line), respectively. The isotype control was negative (not shown). HLA-DR is also induced by IFN-γ, but its encoding mRNA is not targeted for rapid degradation as described for IL-6 and IL-8. Despite an increased HLA-DR expression after 24 h exposure to IFN-γ, tryptophan did not reduce the HLA-DR expression (n = 2; Fig. 3⇑B). These findings indicate that the effect of tryptophan suppletion is not restricted to IFN-γ-inducible proteins only, nor that it affects expression of all proteins induced by IFN-γ. The inhibition of IL-6 and IL-8 expression by exogenous tryptophan is similar to an IFN-γ-induced effect on the degradation of labile mRNAs. Based on our previous studies, we proposed that IFN-γ, by the depletion of tryptophan, partially inhibited de novo protein synthesis resulting in a reduced IL-6 and IL-8 mRNA degradation. Protein synthesis was assessed by 14C-leucine incorporation by cells exposed for 0, 8, 16 and 24 h to medium with and without IFN-γ. Table I⇓ summarizes the data from three independent experiments, showing partial inhibition of protein synthesis after 16 and 24 h of incubation with IFN-γ. Addition of tryptophan restored and even increased protein synthesis further compared with that of untreated cells (data not shown). Next, we determined IL-6 and IL-8 mRNA t1/2 in cells exposed to IFN-γ for 24 h. IL-6 mRNA t1/2 in cells exposed to IFN-γ for 20, 24 and 32 h increased on average 2.2-fold, from 25 ± 2 to 54 ± 24 min (Kruskal-Wallis; p < 0.05). Addition of tryptophan in combination with IFN-γ reduced IL-6 mRNA t1/2 to 32 ± 8 min, which is a 69% reduction. IL-8 mRNA t1/2 increased from 39 ± 6 min (mean ± SD) in the absence of IFN-γ to 261 ± 126 min (mean ± SD) after exposure for 24 h to IFN-γ—a 7-fold increase (n = 4; Kruskal-Wallis; p < 0.01). IFN-γ in combination with exogenous tryptophan, reduced IL-8 mRNA t1/2 to 48 ± 17 min (n = 3; mean ± SD; Kruskal-Wallis; p < 0.05), similar to that in untreated cells. These findings indicate that tryptophan depletion leads to a reduced IL-6 and IL-8 mRNA degradation. Previously, we have shown that NCI-H292 cells with a reduced IL-6 and IL-8 mRNA degradation show amplified IL-6 and IL-8 responses to stimuli, as reflected by steeper dose-response curves (17). Cells pre-exposed to IFN-γ for 24 h as compared with cells not exposed to IFN-γ showed steeper dose-response curves, particularly evident at the lower concentrations of TNF-α (Fig. 4⇓) and of LPS (0 to 10 μg/ml; not shown). Adding tryptophan together with the stimulus, or 1 h before adding the stimulus (not shown), reduced the steepness of both dose response curves (Fig. 4⇓). Whereas the addition of tryptophan almost completely reversed the effect of IFN-γ on the IL-8 production, for IL-6 the production remained higher than with TNF-α alone. 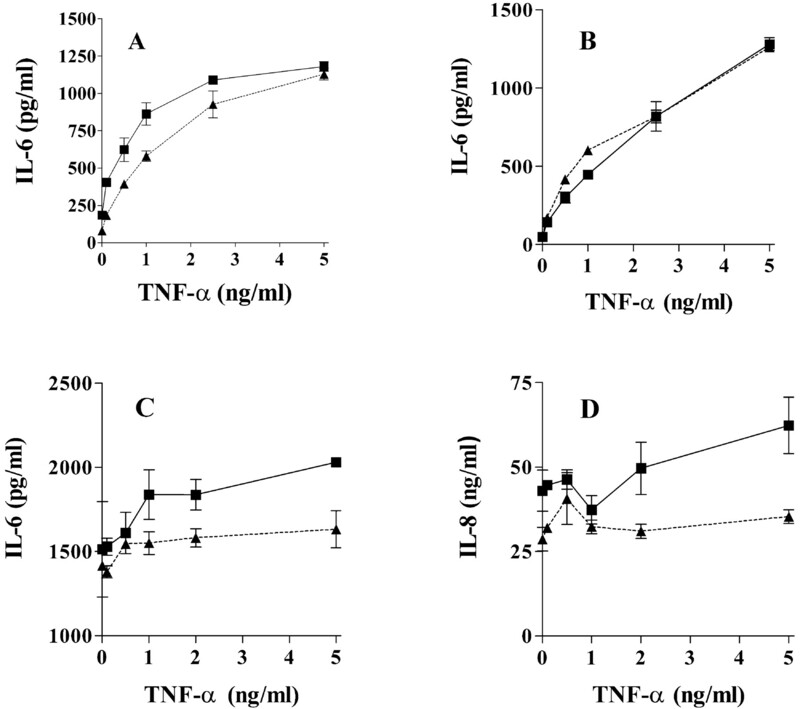 IFN-γ amplifies dose-response curves to TNF-α for IL-6 (A) and IL-8 (B). NCI-H292 cells were (▴ and ▾) or were not (□) exposed to 100 U/ml IFN-γ for 24 h. Then, a concentration range of TNF-α was added, with (▾) or without (▴) exogenous tryptophan, and supernatants were collected after 8 h. IL-6 and IL-8 were determined by ELISA. Typical experiment is shown (triplicate samples; mean ± SD). Thus, depletion of tryptophan via IDO is a key factor in modulating IL-6 and IL-8 responses by NCI-H292 cells. As IDO oxidizes tryptophan at the expense of reactive oxygen species like superoxide, it may be argued that it is not strictly the depletion of tryptophan, but rather the removal of superoxide that causes modulation of the IL-6 and IL-8 responses. To further clarify this, we transferred medium from cells, exposed for 24 h to IFN-γ, to cells not stimulated and thus not expressing IDO. Subsequently, these cells were stimulated with TNF-α for 8 h in the absence and presence of exogenous tryptophan. 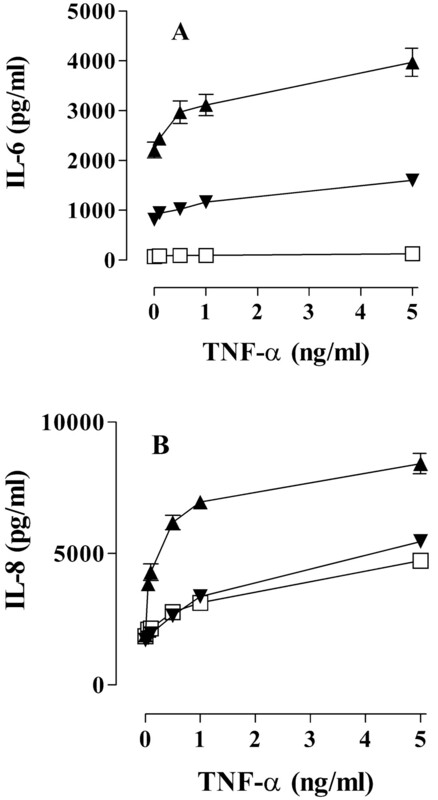 Transfer of the IFN-γ-conditioned medium resulted in a more exaggerated IL-6 response, particularly at low concentrations of TNF-α, as compared with the response in the presence of exogenous tryptophan (Fig. 5⇓, A and B). Conditioned medium from cells not exposed to IFN-γ did not lead to a tryptophan-sensitive response. Tryptophan-sensitive dose-response curves for NCI-H292 cells after exposure to conditioned medium (A and B), and by IFN-γ-stimulated Calu-3 cells (C and D). NCI-H292 cells were exposed to 24 h-conditioned medium from NCI-H292 cells exposed to 100 U/ml IFN-γ (A) or no stimulus (B). Then, a concentration range of TNF-α was added, with (▴) or without (▪) exogenous tryptophan, and supernatants were collected after 8 h. C and D, Calu-3 cells (3 × 105 cells/500 μl) were exposed to 10 U/ml IFN-γ for 48 h. Then, a concentration range of TNF-α was added, with (▴) or without (▪) exogenous tryptophan, and supernatants were collected after 8 h. IL-6 (A–C) and IL-8 (D) were determined by ELISA. One of two similar experiments is shown (triplicate samples; mean ± SD). To determine whether the current mechanism also applied to cells from another airway epithelial-like cell line, we performed similar experiments as described in Fig. 4⇑ for NCI-H292 cells but now with Calu-3 cells. Pilot studies with Calu-3 cells revealed that the induction of IDO (confirmed by Northern blotting; data not shown) and the depletion of tryptophan differed from that for NCI-H292 cells in quantitative terms. Calu-3 cells exposed for 48 h to 10 U/ml IFN-γ displayed tryptophan-sensitive IL-6 and IL-8 responses to TNF-α (Fig. 5⇑, C and D). We have shown that pre-exposure of NCI-H292 cells to IFN-γ for 24 h markedly amplified IL-6 and IL-8 responses to TNF-α and LPS. The underlying mechanism is intriguing. IFN-γ induced the enzyme IDO, which catabolized tryptophan. The depletion of tryptophan coincided with partial inhibition of protein synthesis, less IL-6 and IL-8 mRNA degradation and amplified IL-6 and IL-8 responses. These concurrent changes were prevented by the addition of tryptophan and of the IDO inhibitor MT, illustrating the central role of IDO expression and tryptophan depletion in this mechanism. IDO uses tryptophan to consume superoxide, and thus inhibition of the IFN-γ-induced IL-6 and IL-8 responses by exogenous tryptophan may also relate to decreased levels of superoxide. This is particularly relevant as reactive oxygen species can stimulate the production of IL-6 by airway epithelial cells (32). Our findings, however, are in line with a primary role for depletion of tryptophan. Firstly, IFN-γ-conditioned medium when transferred to unstimulated cells (Fig. 5⇑, A and B) leads to a response that can be dampened by exogenous tryptophan. As cells express little to no IDO after 8 h of exposure to 100 U/ml IFN-γ, the tryptophan-sensitive IL-6 response is due to the IFN-γ-conditioned (tryptophan-depleted) medium. Secondly, if superoxide is a major inducer of IL-6 production in this system, inhibition of IDO by MT might be expected to leave superoxide levels unaffected and thus sustain IL-6 production, whereas we observed a marked decrease (Fig. 2⇑A). However, as MT did not inhibit IFN-γ-induced IL-6 production to the same extent as tryptophan, tryptophan depletion may not be the only mechanism involved. Taken together, the present findings for both NCI-H292 and Calu-3 cells provide further support for a causal relation between a reduced IL-6 and IL-8 mRNA degradation and exaggerated IL-6 and IL-8 responses by airway epithelial cells, as well as the critical role of protein synthesis in regulating these responses (17). Although the addition of tryptophan reduced the steepness of the dose-response curve for IL-6 and further lowered IL-6 production, IL-6 production remained elevated as compared with that of cells not exposed to IFN-γ (Fig. 4⇑). This suggests that IFN-γ induces IL-6 production by two mechanisms; i.e., the tryptophan-sensitive (IDO-mediated) and a tryptophan-insensitive mechanism, which likely involves IL-6 gene transcription. In contrast, IFN-γ exerts its effect on IL-8 production predominantly via the tryptophan-sensitive mechanism, as the addition of tryptophan reversed the effect of IFN-γ on IL-8 production almost completely. Tryptophan depletion resulted in a 2-fold increase of IL-6 mRNA t1/2 and a 7-fold increase of that of IL-8. This indicates that IL-6 mRNA degradation is less affected than IL-8 mRNA degradation in cells exposed to IFN-γ for 24 h. Degradation of labile mRNAs is targeted in general by specific motifs, like AUUUA repeats, in the 3′-untranslated region of mRNA. The number of AUUUA repeats and their position differ between IL-6 and IL-8 mRNA, which may underlie the observed difference between IL-6 and IL-8 mRNA degradation. The role of the enzyme IDO in regulating innate and adaptive immune responses is of considerable interest (33). Earlier studies have implicated IDO in the killing of intracellular parasites by tryptophan starvation. Recently, tryptophan depletion by IDO has been proposed to prevent the development of T cell responses (20, 21, 33). Our results point to a role for tryptophan depletion by IDO in the induction of inflammatory mediators, although in vivo studies are required to further substantiate these findings. The current findings further put IDO at the crossroads of innate and adaptive immune responses. A low expression of IDO may favor the development of T cell responses, whereas a more pronounced expression of IDO may let prevail innate immune responses. Above all, the IFN-γ-induced mechanism described in this study provides an explanation for the increased responsiveness to TNF-α and bacteria after a viral infection. We gratefully acknowledge Dr. S. L. Gupta (Hipple Cancer Research Center) for providing the IDO probe, and Dr. N. G. G. M. Abeling and coworkers (Laboratory of Genetic Metabolic Diseases, Academic Medical Center) for performing the amino acid analyses. We also thank the MSc students, Daniëlle Veenma and Arwen Moens, for carrying out initial experiments. We acknowledge Drs. T. A. Out and R. A. W. van Lier (Department of Experimental Immunology, Academic Medical Center) for critical reading of the typescript. ↵1 This work was supported in part by Grant 97/12 from Stichting Astma Bestrijding and Grant 97.48 from The Netherlands Asthma Foundation. 3 Abbreviations used in this paper: IDO, indoleamine 2,3-dioxygenase; MT, 1-methyl-dl-tryptophan. Ray, C. G.. 1994. Influenza, respiratory syncytial, adenovirus, and other respiratory viruses. K. J. Ryan, ed. Sherris Medical Microbiology: An Introduction to Infectious Diseases 3rd Ed.456 Appleton and Lange, East Norwalk. Loman, S., J. Radl, H. M. Jansen, T. A. Out, R. Lutter. 1997. Vectorial transcytosis of dimeric IgA by the Calu-3 human lung epithelial cell line: upregulation by IFN-γ. Am. J. Physiol. 272: L951-L958.